so lets get them working first. We start by turning it off - that takes care of states 1 and 3. In state 2 we turn it on, while in state 4 we go into a loop blinking it on and off. You might be slightly worried that state 4 never finishes the script, but in Sniff (and Scratch) a new broadcast message restarts the script, so the next "update" will get us out of that infinite loop. If the button is pressed we record that it has been pressed. The only problem with this is that the nice red button on the Pibrella board does't have a pull down resistor. In Python we can use the internal pull downs, but there's no way to code that in Sniff - its a concept which doesn't really fit in the Sniff model cleanly, so I made a simple mod to my board to add one. Without it the button may "press itself" without warning! In the Cellular Automata post a few days ago, I talked about Top Down Design, where you write your code as if all the scripts you need already exist, then fill them in. In this case we've done the opposite - we've built the low level code first: Bottom Up Design, because we knew that we needed to be able to make the lights cycle, but exactly how is a bit trickier. Now we've got the low level stuff going we can worry about the control of the cycle. Now the low level stuff is in place, we can write a nice clean control script. We start by setting state to 1 (green light), and record that the button hasn't been pressed. We also record the time, and broadcast an update to kick off all the light scripts. Now we "wait" until the button has been pressed, and the time since the light went green is greater than 10 seconds. This is quite nice, as it means if the lights have just gone green we keep them green for a minimum period, but if the traffic has been moving freely for a long time, we give priority to the pedestrian. In fact this is the most tricky bit, but because we've already got the little pieces working nicely we can just put them together to make it do exactly what we want. From then on, we simply move through each of the states one at a time, before returning to state 1, and doing the whole thing over again. Another important concept in Software Engineering is "programming in the problem domain". This is a fancy way of saying that if we're writing a program about traffic lights, at the top level (in the main script) is should look like we're writing about traffic lights. Looking at this script it does a pretty good job. How hard would it be it add a second button? Add a "fire engine override" which shortcuts the lights back to green? What if we wanted a red/amber state instead of flashing amber? My finished version also includes code to handle the buzzer - check the Sparkfun Inventor Kit for a discussion on how to make sounds, and then combine that with another script rather like the Amber light script. I could certainly code all of this in C or Python, but it wouldn't look as pretty. Too many programmers think that writing clever or difficult code makes them good programmers. It doesn't. Writing simple and obvious code to solve clever or difficult problems makes you a good programmer. Hopefully you can look at this code, and think its simple and obvious. In that case, I've done my job... Next time you look at someones code and can't figure out what it does or how it works, then don't assume they're better programmers than you - if they were then you'd look at their code and think "that's really clear and obvious"
I read somewhere that the Raspberry Pi is the stone in the stone soup. It doesn't actually add anything itself, but is a catalyst which attracts attention, to which the real ingredients like Scratch are quietly added. Sniff plays along with that, because we want good things to happen, and the Pi gives us a pot of boiling water to jump into (to drag the metaphor along slightly further than is really appropriate). However the Aruduino platform has a lot of advantages over the Pi for interacting with hardware. To effectively use the GPIO you need a breakout board of some kind, which is clunky. You then need to work around all the different pin numbers, which aren't in any kind of sensible order, or even abstracted on a consistent way. Just to make it more fun there's a handy 5V or "blow up my Pi" pin to connect to. It's certainly possible to blow up an Uno in innumerable fun and original ways, but they're a bit tougher, and when you blow up an Uno, worst case its a $10 replacement, or you can probably just replace the CPU (it's socketed!) for less than $5. While some things can't be fixed (like unpredictable timing, and power consumption) the PiBrella board looks like it actually does a pretty good job of solving a lot of the physical problems of Pi interfacing. The PiBrella is clear aimed at kids, providing a red, amber and green LED, a buzzer and a big red button, so they can write a great traffic light simulator. However it also has 4 buffered outputs (with external power available to drive "big" stuff), and 4 protected inputs. They're clearly labeled (A to H), and with nice sockets to poke jumper cables into. Even better there are 8 surface mount led's to indicate the state of each pin... now that is handy. I also like the fact it plugs straight into the Pi without a ribbon cable, so the whole things in one package rather then being spread out over the desk. There's an i2c header too, conveniently layed out with all the required signals in one place (though there are no pins soldered in, and it's a non-standard spacing [expletive deleted]). I2c, 8 i/o ports and a few LEDS and buttons looks like a really sweet spot which can cover most projects. While the PiBrella is clearly designed to be a kids first steps into physical programming, it's actually a pretty grown up bit of kit. For advanced users there are a few niggling issues: To fit all the pre-wired LED's and the i/o ports on the board they've had to use the SPI pins as generic i/o's so SPI won't work with the board plugged in, which is disappointing - looking at the pin usage suggests they might have been able to make this work if they'd allocated the pins differently. Also because all of the i/o pins are buffered that's going to mess with things like the DHT11, and DS One Wire devices which use a single pin for both input and output. 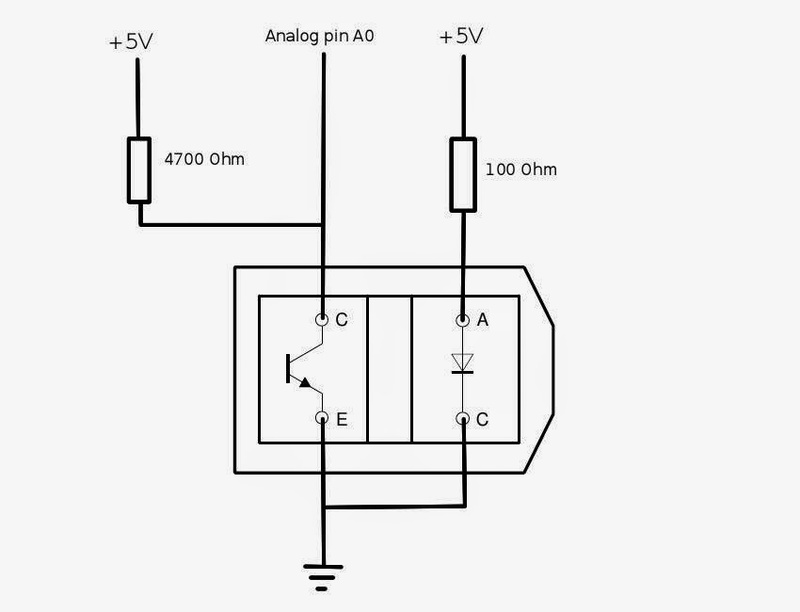 Having gone to all the trouble of laying everything out so clearly, its annoying that the i/o pins are arranged in pairs which are simply labeled + and -. In fact for the inputs, the + is Vcc, and the - is the actual input. I can see this makes sense that kids will just put a switch between + and -, but they'll pretty quickly need to know that these two things are different. Similarly for the outputs. My final niggle is Sniff specific - Sniff doesn't support the Pi's internal pull up/down resistors, and the "big red button" needs a pull down to work correctly. Yes - you can fix it in code (If Sniff supported it), but it's a fraction of a penny component, which would have meant one less thing for the programmer to deal with. I'll probably solder a 10K pulldown on there myself... (edit - have done! details to follow). Perhaps the best feature is that all of this costs only £10. Given that a basic breakout board and cable can cost almost that much, there's a lot to like in this package, whether you're in KS2, or an experienced programmer. Despite the niggles, its currently replaced my regular breakout board. While there are a lot of projects on crowd funding sites which are pretty lazy "we don't have a business plan, so thought we'd ask everyone to send us cash instead", this one looks like a pretty good cause - Tom the designer is an A level student trying to do something pretty cool so deserves support. It uses two pins 15, and 17 which we've called rst (reset) and up. All we have to do is pulse rst to set the count to zero, and then pulse up to increase the value by one, so we loop count times to set it to the value we want (leaving a little delay just to make sure things have time to happen). If you think one of these would be fun to have you can get one for £10 (if you're quick) from http://www.indiegogo.com/projects/7seg-for-raspberry-pi. Cellular Automata are (depending on your point of view) either dumb things that programmers code, really fun toys, or important mathematical tools for understanding the fundamental concepts of computability. So when Simon Walters (@simplecy) posted a challenge on Twitter to produce an interesting CA that only used 8cells, I was hooked. Prehaps I should be honest and say I actually spend weeks as a kid producing these things on a BBC Micro, and printing them out in a long continuous sheet on a tractor feed Epson RX80 to make what looked like 8' long slug trails. Back then they took hours to run, which was a big win because Mandelbrot sets took days! So what are these things: A CA is a set of cells. Each cell has a state, and it has a set of neighbouring cells. At each time time it looks at its neighbouring cells state, and its own state and decides what its new state is going to be. At its simplest a cells state is quite commonly restricted to just alive or dead. The simplest neighbourhood might be the cells to my left and right. A simple rule might be "set my state to state of the cell on my right". While this might sound pretty limited, in fact with only a slightly more complex system we can produce something that's a "Turning Complete" - it can do any calculation your computer can do. That's right - a basic cells in a grid, with a simple rule could by made into an emulator to run any video game for example... OK it's actually not very practical, but in theory its possible, and that's not only cool, but its a really important idea in computing. Simon wanted 8 cells in his list, so here we generate 8 random numbers, and use them to set the 8 states in our list to either on or off. Now we can loop forever, calculating the new state, displaying it, then waiting half a second before moving on. You'll note that I still haven't defined calcNewstate, or showState. This is an idea called "top down design". If I was designing a car I'd decide I need an engine, some wheels and a chassis, and figure out where they would go. Then the engine team would go off and design the engine I need. The important thing is I figure out that I need an engine, and what it needs to do, then I get someone to make one for me. The alternative is sending a team of to make an engine, a team off to make some wheels, a team off to make the propellers, and then when they finish we assemble them, and hope they make a car. This is called "bottom up design", and its important too but its better as a way of implementing you machine, rather than designing it. In practise any real project is a bit of both. Now that I've written the top level, lets fill in the details (bottom up!). ...set result to join result "*"
...set result to join result " "
There's also a new script called pushBack, which copies the new state over the old state ready to go round again. It first deletes all of the items in state, then copies each element over by copying the first element, and then deleting it. There are other ways to do this which might be clearer - I liked it cause it don't use a counter variable! (tech note: its OK to change the repeat count inside the loop - its evaluated once on entry to the loop, in both Scratch and Sniff). We're going to go through state one element at a time, so count is the current item we're looking at. To keep things simple, we're going to let a cell look at its left and right neighbours, so we have a variable left which is one less than count, and right which is one more than count. Then we can set leftState and rightState to be the state of the neighbouring cells. The only catch is what happens at the edges. Simon was actually pretty specific in on respect - the CA wasn't allowed to wrap. Normally we join the edges of CA, so that left of cell one is cell 8, and right of cell 8 is cell 1, but in this case it was banned. However he didn't say what we should do... so we can take some liberties here if left is 0, then we're at the edge, and I've written four possible things we could do: use the state of cell 8 (disallowed), make it always 1, use the state of cell 1, or make it always 0. As these all set leftState, then only the last one actually does anything, so in this case leftState is always off. Here's the clever but. We know leftState, middleState and rightState, so we can put any code we want here to calculate the new state, but with only three Boolean inputs there are only 8 possible combinations, so we convert them into a binary number: LMR and look them up in a list. We can make any rule just by changing the list! Then we're done, and move onto the next cell. Finally we use the pushBack script to copy the new state over the old one which we don't need any more. To define a state we just need to fill in this table. In this case the LMR cells are off off off then the new cell becomes off. Simlarly off off on becomes on. If you look closely you'll release that as there are only 3 inputs, that means there are 8 rows to the table. Each row can be on or off, so there are in fact only 256 ways to fill in the table! To make things even easier we can use the on/off's in the table to make a number 01011010 in binary is 90, so we call this rule 90! Unfortunatly one feature of CA is that they tend to get stuck in loops - you'll seed that the last row is the same as one further up, that means from then on the same pattern of rows will repeat. This is inevitable with only 8 cells - the entrée automata only has 256 possible states in so we're going to his a loop pretty quickly. Things get more fun when you add bigger neighbourhoods and more states! The Beta 5 release is now available on the Downloads page, and it contains lots of fixes, and improvements. However the one you're really interested in is Minecraft support!!! 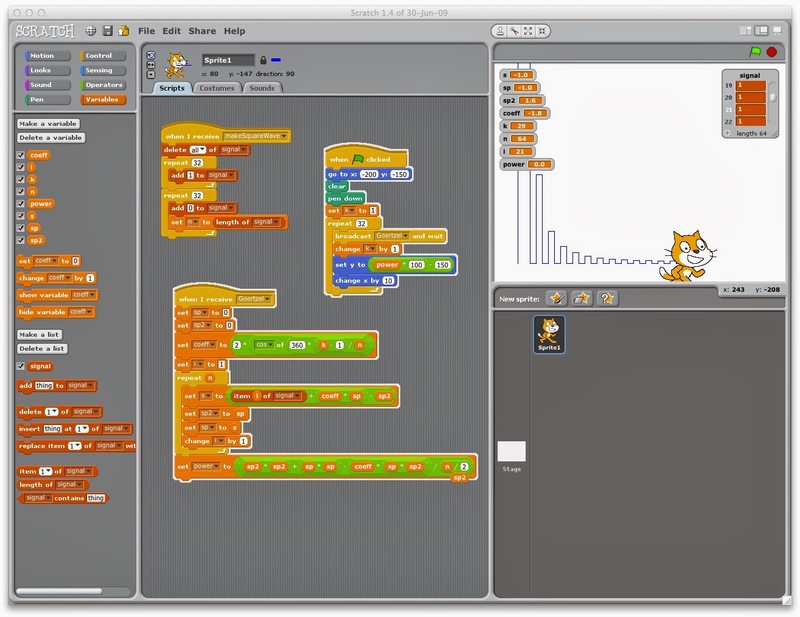 While we love our gadgets, the main concept of Sniff is that its a programming language that lets experienced Scratch users move on to a "written" language that they will be familiar with. The need for this is made clear looking at the Python and Java examples that are provided with the Raspberry Pi version of Minecraft. Minecraft has been released as a free download for Pi, with an option for external programs to tap into it, so that kids can learn to program by writing scripts to build things inside the 3D world. It's a great idea which is let down by the fact that one look at that examples provided will send any kid running and screaming. They're not particularly complex examples but even for an experienced (non-Python) programmer the syntax, and code overhead makes them look difficult and hard to follow. This exactly what Sniff is designed to avoid - Kids already know Scratch, which means that the Sniff syntax is familiar, so they can jump straight into problem solving, and making things! Introducing the Sniff Minecraft Device! You make minecraft device and its variables like any other Sniff device. This sets up the connection to Pi Minecraft running on the current machine (if you want to use a different machine you can edit lib/Xminecraft.c - not recommended for public editing, but its pretty easy). .set message to "Sniff woz here"
Moves the player to square (5,6). However before doing so, it checks the height of the land at that square, which sets mcY to the right value (Y is up) so that the player is standing on the ground rather than flying (or burried!). You can also check the players position with "getPos"
.set message to "like my tower?" We set x/y/z to 0 (the spawn point). We check the block at that position, which gives us the blockType (ID). In addition blockData tells is more about the block (http://minecraft.gamepedia.com/Data_values). If the block is currently air (type 0), then we set it to 1 (stone), which builds a tower. If there's already a block there (because we've run the code before) we delete it by setting it to air. There are other aspects to the Minecraft API, but they either provide duplicate ways of doing things we can already to with these functions, or they're not completely implemented/documented in the current release of minecraft for Pi. If I've missed anything that we should add, then either add it yourself (the files are there for you to change, and we'd love to receive your improvements), or email/DM/leave a comment letting us know. So what are you waiting for? Go program Minecraft using Scratch like syntax! After the success of generating sound directly in Sniff, I guess I had some signal processing ideas in my head (Also I taught a class on sampling theory yesterday so maybe that had something to do with it!). Recording audio is pretty easy - just hook a mic up to an analog input and you can measure it sufficiently fast to fill up an Arduino's memory in no time at all. We could easily record a snapshot of audio and draw it on screen, but to see what's really going on plotting amplitude against time is only of limited use. To get a good look inside a piece of audio we need to plot amplitude against frequency. Almost all sounds are a mix of low sounds and high sounds played at the same time, and drawing them this way lets us see how a particular complex sound is made up from these simpler components. At this point a whole load of complex maths gets involved, but the main thing is that we can convert our simple amplitude/time recording to a amplitude/frequency version using a Fourier Transform. There's a special version of this that we normally use when we implement it on a computer called the Fast Fourier Transform or FFT for short. That's not to say that the FFT is fast - it's still quite a lot of work for a small computer, but its the fastest way to do it. There are a bunch of FFT libraries which you can download (including some good ones for Arduino), because you really don't want to write your own - its tricky, and to get good performance you need to add in a lot of tricks (check out FFTW for a serious implementation). There's also the issue that if we're running on Arduino we don't have a lot of memory. To make the FFT run quickly they use a lot of precomputed tables which are going to eat up memory. Then I stumbled across the Goertzel algorithm - its slower than an FFT if you can't to compute the full transform, but has the neat property that it calculates one value at a time - if we're plotting the graph we can calculate each point independently rather than having to calculate all the points. It's also light on trig functions, so we don't need any pre-computed tables. In other words its slower, but doesn't use any significant memory other than the source data. In fact if we only want to measure a particular frequency (how much 440Hz is in this audio) then we don't even need to store the incoming signal! As an extra bonus its much simpler that an FFT, and is non-recursive. This fills x with a 64 samples of a square wave. Next we can use the Goertzel code to show how much energy is in the signal a frequencies from 0 (any constant signal) 1 (1 wave is 64 samples) up to 32 (32 cycles within the 64 samples we have). It basically goes through the list of samples calculating a value s which at each step by summing the value of that sample, and the value of s at the previous two steps (sp and sp2). The sum is weighted by coeff which is dependant on the frequency band we're interested in. You'll see that the 0 has a value of 32 - the sum of all the samples. The value of 1 is large because our square wave looks a lot like a sine wave of period 64. From there we see that all of the even values are 0, and the odd values decrease progressively -the frequency signature of a square wave! It's pretty slow - on an Uno its around 0.1 secs, excluding the printing, which is far slower than an FFT, but there's a big win in terms of simplicity, flexibility memory footprint. But here's the fun bit... Scratch and Sniff are essentially the same language: If we can do it in Sniff we can do it in Scratch! It's also a great endorsement of Scratch - we solved a University level problem in a Kindergarten tool! It shows that as a language Scratch is sufficiently powerful to express complex ideas, though for experienced programmers Sniff is probably a better way to do Scratch! I recently stumbled across the Sparkfun Inventor Kit (https://www.sparkfun.com/products/12001) - This is a great kit of bits and pieces to get you started with Arduino. It includes a bunch of handy components to get you started, but more importantly it includes a really great guidebook which walks you through 15 mini-projects using the components in the kit. It's a great way for kids to get started, but of course it used standard Arduino/C++ which is probably going to be hard work for younger kids (the kit is listed as being for ages 10+, which is probably reasonable in terms of the physical components but ambitious in terms of the coding), so I thought it would be fun to rewrite the 15 examples in Sniff. Setting the half wavelength to 0 makes the sound well outside of human hearing (and the capabilities of any audio system to reproduce it!) The full example uses a string of note names, from which we pick out the letters, and look them up in a list to find their frequency. You can download the full set of SIK examples from the link below. They're not all fully tested, as I don't have the exact components needed, so there's sure to be a few bugs - let us know so we can fix them. This code will be included with the examples in future Sniff releases. 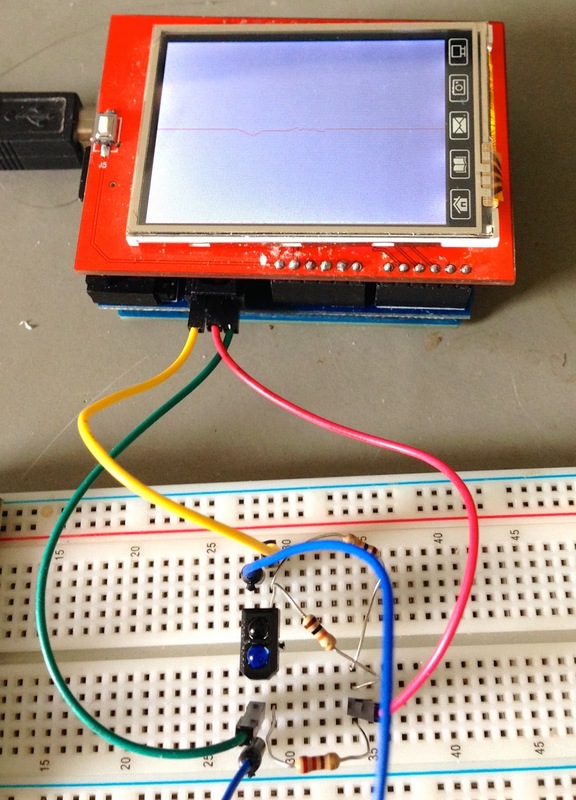 We all love quick, and cheap science projects, so when I saw a "heart rate sensor for Arduino" on Ebay I almost grabbed one instantly... but then I looked a bit closer and realised that it looked a bit shoddy... Was I really getting value for money from my hard earned $2? Reading the description and looking at the picture it appeared this thing was just and IR led, and photo-transistor soldered onto a PCB. The LED shines into your fingertip, the photo-resistor measures how much is reflected back (or transmitted - either should work). It turns out this is a perfectly reasonable way to measure blood flow. More blood means more (or maybe less?) reflection, means a changing voltage we can measure, and plot! However I didn't feel like blowing a whole $2 on this - times are tight, and anyway I bought a whole bunch of IR emitter/photo-transistor packages last week to do proximity sensing! They're called TCRT5000's and for $2 you'll get a bag of ten. Wiring them up just needs a couple of resistors, and we can start measuring with them. We need analog input so this isn't going to run on a Pi, but hooking this into an Arduino Uno I started getting measurements: about 0.9 when the sensor was clear, and about 0.03 when I put my thumb over it. The reading of 0.03 is a bit small, but importantly, it did seem to be changing in time with my pulse. I adjusted the resistor value on the photo-transistor, and got a reading of somewhere between 0.17 and 0.19 which was clearly indicating that I definitely have a pulse. the tft device has an "hfill" command that makes it quick to blank out an individual line - there's no equivalent vfill (perhaps there should be?) so it was easiest to plot the graph from bottom to top, and then turn the screen around when it was finished. We pick a row based on time (40 samples per second was perfectly manageable with this hardware and looked about right), and assign that to displayY so all drawing takes place on that line. One minor problem was that depending on how hard I pressed and what part of my thumb I used the values could change substantially - the trace would disappear completely if I moved my thumb a little too much. We're only interested in the variation with a period of about 0.5 seconds, so the final refinement was to add an averageValue variable which is the average of the reading over several seconds. By removing the, we still get the the nice pulse, but the graph automatically centres itself on screen if you keep your finger still for a few seconds. Isn't that the best $0.20 you ever spent? That didn't take long. After a little tweaking on the trim pots on the sensor to adjust its sensitivity, it was firing nicely whenever there was any movement around my desk. ...set command to "raspistill -o image.jpg"
...set filename to join clockValue ".jpg"
...set command to "raspistill -o "
Now we use the clock device to get the real time in hours/min/secs (timer just gives us time since the program started - clock actually knows the time of day), and use that to make a filename. Raspberry Pi support first appeared in Beta 3, but only as a generic Unix platform. Beta4 which has just been released takes this a step further, and makes the Pi a fully capable Sniff platform, comparable to the Arduino. If you install WiringPi before compiling your Sniff program it will be detected, allowing you to write Sniff code which access the GPIO (including SPI and I2C). It's written in such a way that most of the existing "devices" which were supported on Arduino, now work on Pi too. In addition to the existing devices, we've added a bunch of new devices especially for Pi. While you can still hang an sdcard reader on the GPIO port, and access files that way, the new nativeFile device behaves just like the old fileSystem device but accesses the regular Pi files. 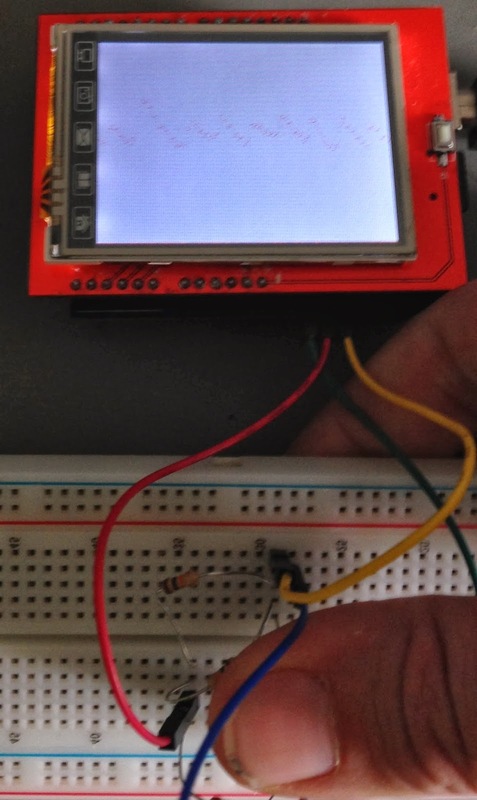 Simlarly framebuffer behaves like the old Arduino's tft device, but uses the Pi's built in graphics. Finally taking a leaf from the Galeleo there's the "system" device, which lets you run a regular Pi command from inside Sniff. I'm planning on using a Syndrome from Disney Infiniti/Incredibles to trigger an RFID reader to shut down my Pi by running "poweroff"! (as soon as I've debugged the RFID reader). We're hard at work on the Beta 4 release, which is looking like its going to focus on the Pi: it should detect if you have wiringPi installed, and use it to access the GPIO port. SPI, and I2C should be working, so devices like the RFID reader, and the Wii NunChuck should work on Pi just as well as they do on Arduino. However I couldn't resist a quick physics experiment. 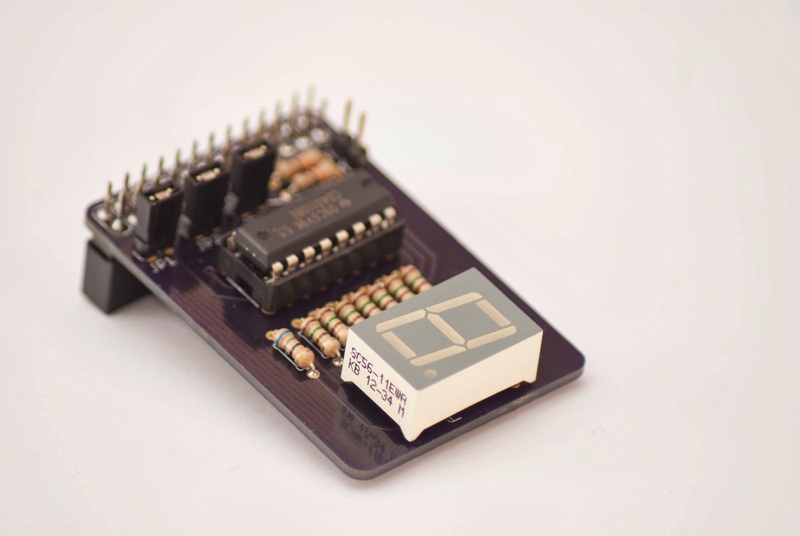 Plug in the tft shield, and add a ds18 temperature sensor on pin A5 (the only one that shield leaves free! 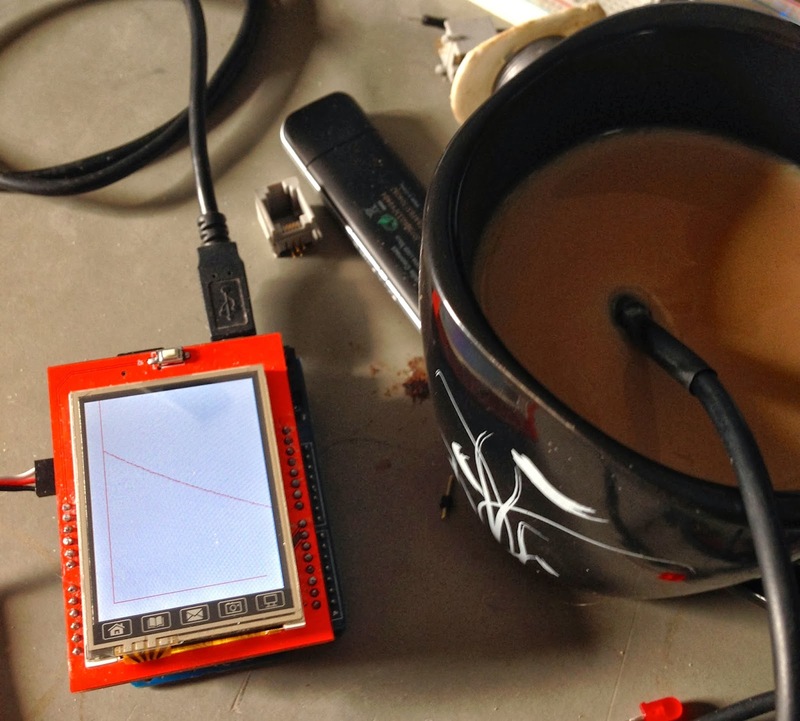 ), and we an plot a graph of my coffee cooling!